CompuApps Renaissance - is an ideal Backup solution designed for small to mid-sized businesses and home users with a simplified user interface and advanced technology. Keriver Image -Is a backup program.It is a cloning or imaging utility to help you protect yourself from data losses. It will backups the contents of a hard disk or partition. The contents are saved as a image file that can be restored later to a disk or partition. Synchromat 3.1.1 - A Windows data synchronizer that can synchronize your data between desktop PCs, laptops, USB drives, flash keys, MP3 players, digital cameras and more. 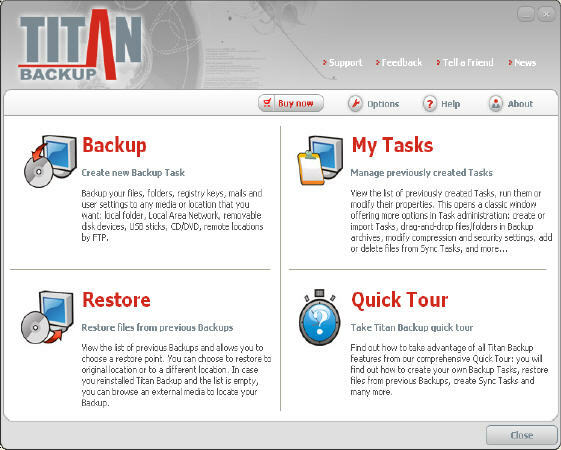 Titan Backup 1.2.04 - The ultimate backup solution - Secure, Automated, Easy-to-use backups of your important files and documents, emails and rules, registry, settings.Features 256-bit AES encryption to ensure full security of your confidential data. 5star Game opy 1.0.5.118 - A backup tool that integrates several varied backup techniques, such as VOB Protect CD, StarForce 1 & 2, SafeDisc, Securecom, and copying DVDs, etc. FileMonkey 10.57 - Copy, move, split, search, replace, rename, alter case, generate lists, trim, truncate, crop, chop, set attributes, encypt, decrypt, wipe, delete, extract and more. Argentum Backup 2.50 - With Argentum Backup, you can simply create a number of tasks with files on your computer, which you want to copy to the backup store. WinBackup 2.0 - Secure all your valuable data, Backup emails, address books, bookmarks, digital images, financial documents and other records. Static Email Assist - a powerful email backup software and email tool which can backup, restore your email, important data from Outlook Express, Windows Mail. Static Eudora Backup - a powerful backup tool which can backup all your emails, Eudora messages and settings into an archive file. Static Becky Backup - a powerful backup tool which can backup all your emails, Becky messages and settings into an archive file. Static Thunderbird Backup - a powerful backup tool which will backup all your emails and settings from Thunderbird. APBackUp 2.7 - Automatic backup tool that allows you to back up your data to local or network drives, FTP or LAN. AttributeMagic Pro 2.3 - Change any file or folder date/time stamps and attributes, such as MS Office documents, JPEG file metadata, etc, and batch rename files or folders. Auto Backup 2.4 - Automatic backup your critical data to a local disk, do integrated encryption, compression, and can use password protection. Autosave Your Edit 2.0 - Autosave your document, program code when you are editing them, and enable to set the interval time to autosave for every program. Batch File Utility 3.0 - Rename batch files, rename multiple MP3 files with accurate ID3 information, rename file extensions, etc. Doppelganger XP 5.0.3.1 - Protects against loss of important data by copying selected files and folders to a second hard drive, removable drive, or network drive, etc. AccuSplit 3.7.1 - Split large files and computer videos into smaller segments to allow for easy archival to external media like DVD, CD-R, Zip or floppy disks. SyClone Builder Professional - SyClone Builder Edition is a Disk-to-Disk 'D2D' disk cloning/Backup program. Backup to external USB or Firewire drives. Vision Backup Home - Vision Backup Home was designed to simplify home data backups with an easy to use GUI. Backup and restore to multiple media's including CDR-RW/DVD-RW, USB/Flash Drives and Hard Drives. Vision Backup PRO - Vision Backup PRO is a robust backup and recovery tool designed to protect your “connected world”. This is accomplished by enabling your organization to protect their entire network through one single screen. File Access Manager Workstation -File Access Manager, is a robust open file utility that gives your backup software the power to backup any open, locked or in-use file, ensuring that your business will run without interruption twenty four hours day, seven days a week. O&O DiskImage 2 Professional Edition - O&O DiskImage 2 can perform either an incremental imaging or just as easily image an entire system. The imaged data can then be encrypted and also compressed to various different levels. Software Oasis Backup Utility -Quickly and easily create scheduled or instant backups of your sensitive data with the Software Oasis® Backup UtilityTM. Software Oasis File Sync Utility - Quickly sync individual files or groups of data across your network or on an individual pc or notebook.It can be set to continuously synchronize your data or for a single instant sync. CompuApps DriveWizard for Mac - Powerful solution for Data Migration (hard drive clone, upgrading) and backup.